la, cello players and the like. Players can drop in to the music circle anytime during the day from 12:00 to 5:00pm. All ages of participants may bring tunes for all in the circle to play (or sing). Folks are welcome to sing along or just to watch. Admission is free. 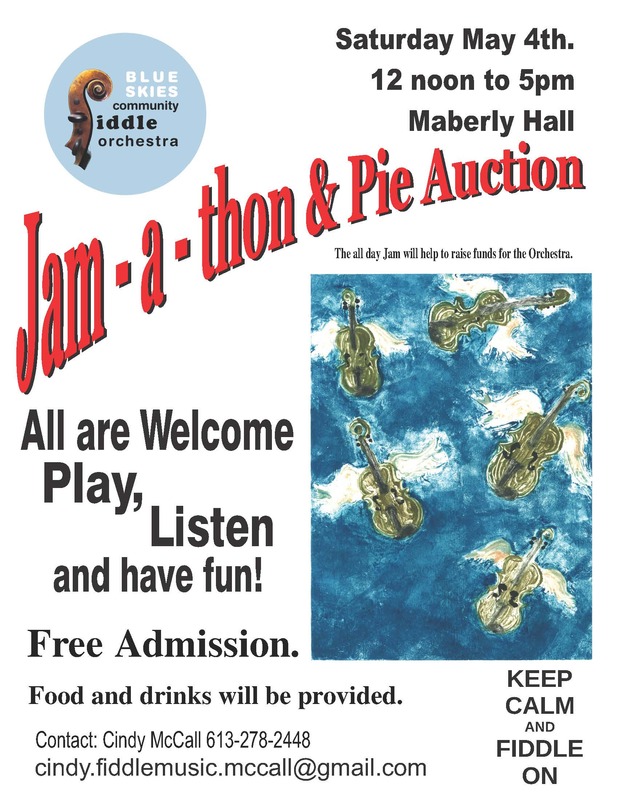 At 2:00 pm there will be a massive pie auction, with the proceeds going to support the Fiddle Orchestra’s ongoing programs. Refreshments will be available for players throughout the day. Support the orchestra by sponsoring an orchestra member or by getting your own sponsors. Players obtain sponsors, collect the funds and bring them to the Maberly Hall on Saturday May 4th. 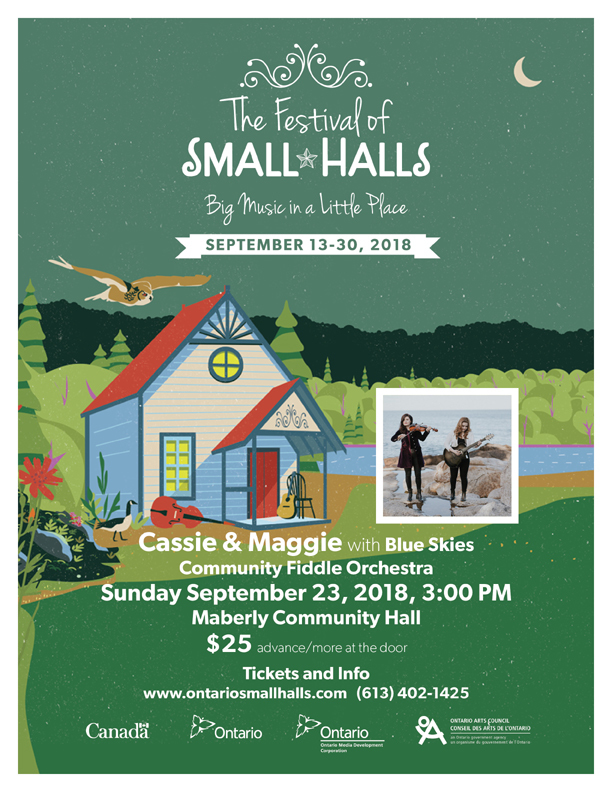 “The Blue Skies Community Fiddle Orchestra” directed by Cindy McCall is an all ages group of 50+ fiddlers, with guitar, percussion, whistle, viola, cello, bass and flute accompaniment. They will perform some of their recently perfected delightful repertoire. This enthusiastic bunch hails from the rural areas close by and rehearses every other Sat and Wednesday at the Maberly Hall. Their fiddle music is sure to get your toes tapping and the fun they are having is contagious! 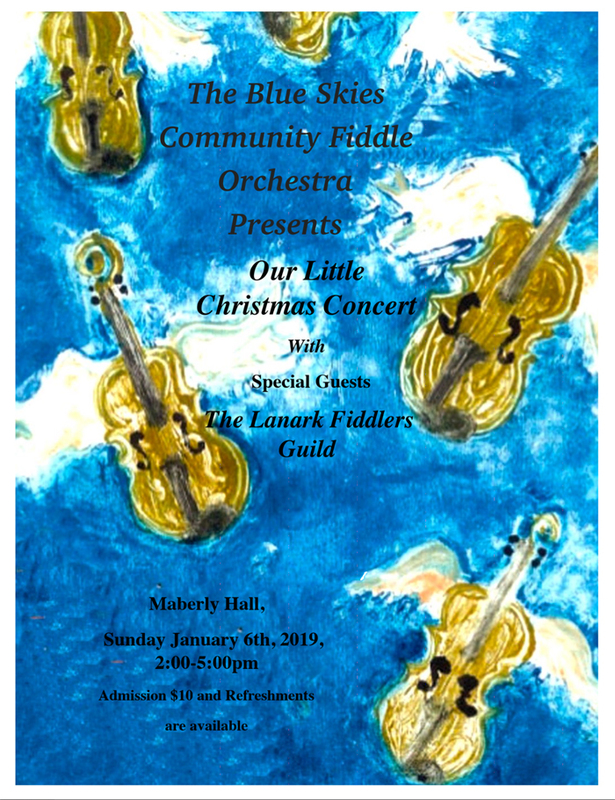 The Lanark Fiddlers Guild directed by Cindy McCall will perform a selection of Celtic and Christmas tunes. Their arrangements will make the old wooden hall ring with splendor. Then the Fiddlers Guild will join together with the Blue Skies Fiddlers for a dynamic selection of seasonal favourites from all over the world. for our annual “ Little Christmas Concert”. Admission is $10 at the door. Children are free. The Blue Skies Community Fiddle Orchestra is just starting it’s 19th year. We are an all ages Community Fiddle Orchestra with members that come from all over Lanark and Frontenac Counties. We perform at festivals, local schools and community events. We are currently opening up to absolute beginners! Once in awhile Cindy McCall, the conductor of The Blue Skies Community Fiddle Orchestra starts a “New Beginner Group.” The group is small group of students, learning basic technique and reading music for Fiddle, or Mandolin. The students spend at least 2 years together before they join the main Blue Skies Orchestra, learning to read music, play together and follow a conductor. The group is open to individuals ages 8yrs and up to 100. If you don’t have a fiddle Cindy can set you up with one of the fiddles from the Blue Skies Fiddle lending Library at a nominal cost of $10 a month. Classes are only $50 per semester. Thanks to Blue Skies in The Community for the support. New Group starts Oct 17th. 4pm at the Maberly Hall. Practices are every second Saturday from 1pm to 2pm and every second Wednesday from 4:30 to 5:30 at the Maberly Hall.